Jameson Archer, 14, freshman at Sheridan Junior High, has been recognized as one of Arkansas’ top youth volunteers of 2018 by The Prudential Spirit of Community Awards, a nationwide program honoring young people for outstanding acts of volunteerism. A Distinguished Finalist, Archer is one of just six honorees from Arkansas. 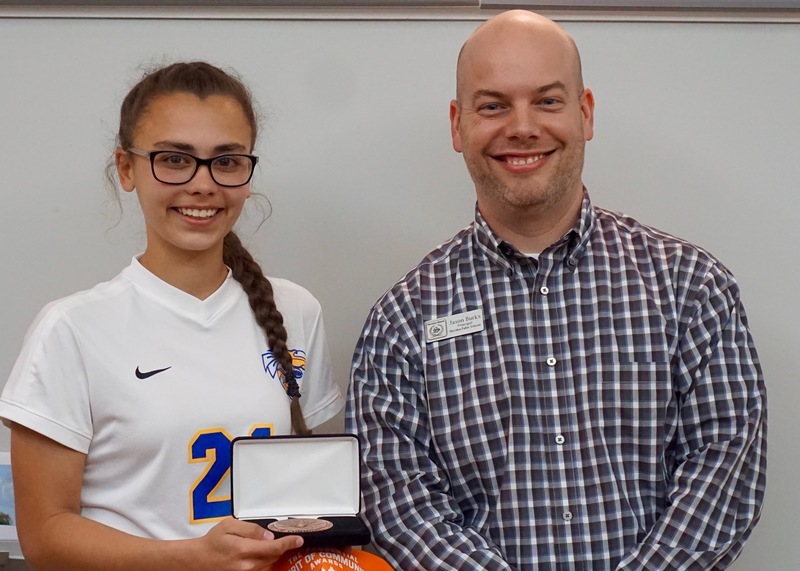 At the Sheridan School Board Meeting held on March 12, her principal, Jason Burks, had the privilege of presenting her with an engraved bronze medallion and recognizing her for her work in starting a community quarter drive that supports the Sheridan’s food backpack program for students who don’t have enough to eat at home. It was in fourth grade when Jameson Archer became inspired to fight childhood hunger. She took a trip to the Heifer Ranch in Perryville with her mother, Shannon, and watched a moving video of a mother who lost her young child due to starvation. Months later after seeing a money collection box for a local charity, she came up with the idea to start the quarter drive and asked her father, Joe, to make her six collection boxes for quarters. After four years, the quarter drive has raised more than $2,200 for the school backpack program. Jameson Archer says the quarter drive has now become one of her church youth group’s major philanthropies. According to Jameson Archer, fighting childhood hunger should be a priority for everyone. “The thought of another child not having access to food is just unbearable to me,” she said. Anyone interested in donating to the quarter drive should bring their quarters to First United Methodist Church of Sheridan. For more information about donating time or money to the food backpack program, contact Sam Green at 501-416-0617.